Major general, C.S.A. Promoted after victory at Battle of Plymouth. Led troops in Va. & N.C. Home stands 50 yards E.
Robert F. Hoke, Confederate general, was born in Lincolnton on May 27, 1837, the son of Michael and Frances Burton Hoke, only fourteen days after fellow Lincoln County native and future Confederate general Stephen D. Ramseur. His father, a local attorney, had been the Democratic candidate for governor in 1844. In 1854, Hoke graduated from the Kentucky Military Institute, and afterwards returned home to help manage several of the family’s business ventures including a cotton mill and an iron works. Upon the outbreak of the Civil War, Hoke received a commission as a second lieutenant in the 1st North Carolina Volunteers, with whom he served at the Big Bethel, the first land battle of the war, on June 10, 1861. Having received a commendation from D. H. Hill for his “coolness, judgment, and efficiency,” Hoke moved through the ranks quickly and by September held the rank of major. He subsequently was promoted to lieutenant colonel and transferred to the 23rd North Carolina Infantry. After the commanding officer of the 33rd North Carolina was captured at New Bern in March 1862, Hoke temporarily was assigned as that regiment’s commander. He led the regiment through the Seven Days Campaign, Second Manassas, and Sharpsburg, before being transferred to the 21st North Carolina. At Fredericksburg in December 1862, Hoke received a commendation from General Jubal Early and subsequently was promoted to brigadier general. In May 1863, Hoke was severely wounded leading his brigade in the Chancellorsville campaign, and returned home to recuperate. After recovering from his injuries, Brigadier General Hoke was given a brigade in eastern North Carolina under the command of General George E. Pickett. Following the siege of Washington, Pickett was recalled to Virginia, and Hoke took command of all Confederate forces in eastern North Carolina. 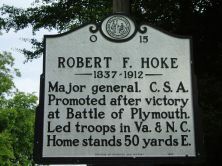 For his capture of Plymouth, and its 3,000-man Union garrison, Hoke received a promotion to major general. Hoke’s division spent the fall and winter of 1864 manning trenches outside Petersburg, before being ordered to aide in the defense of Wilmington. 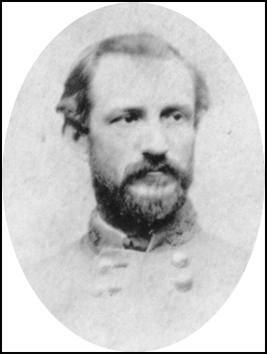 After the fall of Fort Fisher, his division of North Carolinians attached themselves to General Joseph E. Johnston’s Confederate Army of Tennessee, and participated in the battles of Southwest Creek and Bentonville. Hoke and his men surrendered at Bennett Place with Johnston’s army. After the war, Hoke became an industrialist and entrepreneur, operating several gold and iron mines, an insurance company, and serving as director of the North Carolina Railroad Company. On January 7, 1869 he married Lydia Van Wyck, with whom he fathered six children. One son, Michael Hoke, became a prominent surgeon. 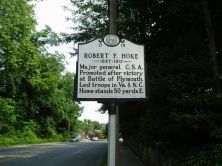 Robert F. Hoke died on July 3, 1912 and is buried in Raleigh. Hoke County is named for him.